I'm not knowledgeable about wine, but I do prefer it to beer. 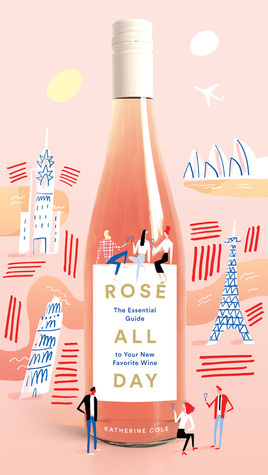 So when I saw this book, I thought it was a good time to learn a little bit more about rosé, which I didn't even realise was a separate category (I thought it was a little bit like champagne rather than a third category). Basically, rosé can be made many different ways. You can use red grapes, you can use white grapes and red grapes and you can basically mix them in a bunch of different ways. And that's everything that I got out of the technical aspect. I will probably have to reread that section. After the first chapter, which talks about the history what makes rosé, rosé, the book goes into detail on the different regions that produce the wine, as well as the recommended wines from each region. There's a helpful price guide, so if you're budget conscious, you can just look for the single $ sign wines and ignore the rest. Unfortunately, there isn't a list of all the names of wines categorised by price, but there is a list of top 5 wines for each price range, which could be helpful. The book also has a list of websites that you can buy rosé from, though I don't know which countries it sells to. If you're interested in drinking more rosé and/or learning about it, I think this book will be a helpful guide. Even if you don't want to learn about its history, you could use the rest of the book as a guide to picking out wines. Finally finished another book for the SEAReadingChallenge! 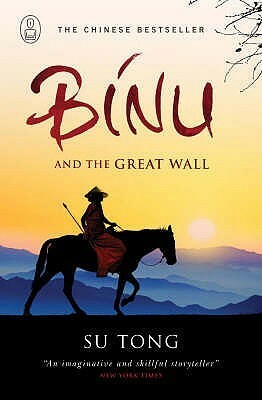 This book is from Vietnam and it's the first non-fiction book that I've read for the challenge. 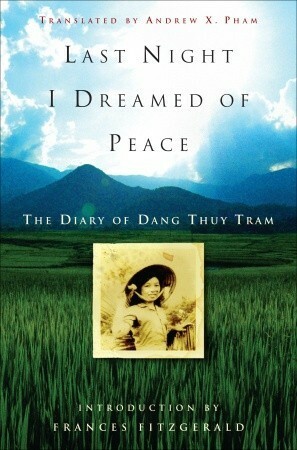 Last Night I Dreamed Of Peace is a diary written by a young (27 when she died, only slightly older than me!) Vietnamese doctor as she worked in the front lines during the Vietnam War. I think this is my favourite book of the challenge so far! Dang Thuy Tram is an introspective woman and she writes extremely movingly about what she sees and experiences. It's an extremely good reminder that there are two sides to every story, and that even on the 'wrong' side (Dang Thuy Tram is from North Vietnam), there are people who truly believe in what they're fighting for. But the thing about the book that occasionally annoyed me (and this is no fault of the translators) is how naive Dang Thuy Tram is. Apart from the fact that she doesn't ever change her view of the communist party or the other side (she comes close in the beginning but seems to double down on her beliefs after), the number of 'pure love' relationships she has is... staggering. I'm pretty sure that some of those guys are in love with her, but she basically denies everything. And while that was fine with me in the beginning, the fact that her mindset never change got a little annoying towards the end of the book. I was expecting her to grow but she didn't. Still, I managed to suppress these feelings for the most part, and I genuinely enjoyed reading this book. If you want to see another facet of the Vietnam war, you have to pick this up. Hey everyone! It's Tuesday again and I managed to start another book(: Although I'll be working over the weekend, I do have tomorrow off (and I'm planning to meet some friends so I may not get much reading done). 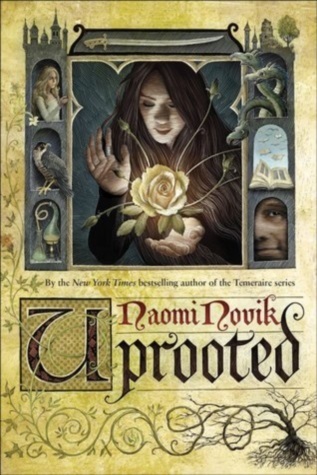 Right now, I'm reading Uprooted by Naomi Novik, which was actually a recommendation from Wendy over at Literary Feline! I read her review and just had to read the book, especially since the library has it. I'm thoroughly enjoying it, so thank you so much for the review! "When we were through I slid to the floor next to my small heap of pine-needle ashes and stared at them, hollow. I almost hated them for stealing the lie from me." What about you? What are you reading right now? 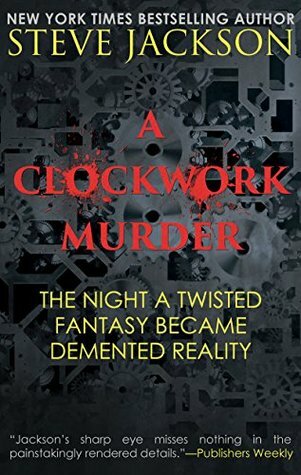 A Clockwork Murder is a true-crime book about the murder of Jacine Gielinski. She was brutally raped and forced to hear her killers discuss how they would kill her before she finally died. It was a slow, painful death and the worst part is that she was randomly chosen. Thankfully, her killers were caught almost immediately and couldn't carry out any more crimes. Not thankfully, it took over 3 years before Jacine's parents got any closer because despite the fact that both of her killers confessed, their defence attorneys still tied the whole thing up in paperwork. And perhaps most despicably, tried to manipulate her parents into giving up. Both of them were found guilty but they did not get the death penalty in the end. And the relationship between the two killers was... really odd. Her killers were these two guys called Lucas Salmon and George Woldt and they had an extremely dysfunctional relationship. George was violent and sadistic since young, and though Lucas was his opposite and constantly humiliated by his 'friend', he still did all he could to keep in George's good graces. Overall, this was a really good read. There was one part where I thought the book was starting to lag (we were going into a bit too much detail about the lawyers for my taste) but it soon got back on the trial and I found myself reading all the way to the end. 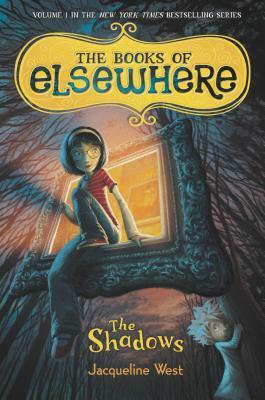 Any book that is compared to Coraline is one that I will be trying. Sometimes, literary comparisons are off, but this one was great - fun and a little spooky and with cats. The Shadows follows the journey of Olive as she and her mathematician parents move into their new house, which comes with creepy furniture. Unlike her parents, Olive isn't good at maths (I feel a connection to her already). Luckily for her, she doesn't need maths for what happens. It turns out that this house is... not normal. Olive can enter paintings and talk to the people inside, and there are three cats that talk to her too. Unfortunately, cats will be cats and their hints were a little too cryptic. As a result, Olive accidentally unleashes evil onto the house and has to remedy it. The book has a fantastic protagonist in Olive. She's likable and plucky, and I liked that she got herself out of the mistakes she made (also, she didn't like everyone, but still apologised when she was wrong). She made a great team with the three cats, whom I'd like to meet. The cats are: Horatio, who's a bit cranky and cryptic, Leopold, who's very polite and I just want to cuddle him, and Harvey, who takes on different personalities and serves as comedic relief sometimes. There's also Morton, a strange boy who isn't who he seems to be. He's also a little annoying so I don't have much to say about him. He was one of the people who introduced Olive to this odd world, though, so he is a fairly important character. Oh, and this isn't as scary as Coraline, although it is a bit creepy. But I do agree that fans of Coraline will like this. At least I did. Hey everyone! I'm now in my actual department (second day!) and am slowly getting used to work. Which means I haven't had much time to read, although I try to make up for that on the weekend. Right now, I'm slowly reading Last Night I Dreamed of Peace as part of my SEA reading challenge. It's a diary of a doctor who worked for North Vietnam during the Vietnam war. "With only a few short minutes in the middle of the crowd, I somehow comprehend and feel what those dear eyes are saying to me: We are silent, but we understand each other entirely. I'm not very familiar with the idea of "privilege", so I decided it would be a good idea read up on it, especially since I see notions of it creeping into Singapore culture (the word "Chinese privilege" has been appearing a few times). I am normally wary of importing American social justice methods wholesale, because it seems to have led to a more divided America which makes me question its efficacy and more importantly, because Singapore is not America and we need to adjust for that. But I am digressing. I spent one day just reading the book and writing out my thoughts on it. Normally, I'd copy the review over, but it's much, much longer than anything I've ever done, so I'll just link to it. "On this much, the privilege framework is accurate: Society has hierarchies, and some categories of people are - all things equal - luckier than others. Those who deny that "privilege" exists in those broad, sweeping areas where you need your head rather deep in the sand not to have noticed [...] need not so much a privilege check as an introduction to reality. The trouble is that those hierarchies don't explain all injustice, and that they don't always correspond to the hierarchies that "count" according to the privilege framework." "According to news reports, Japanese observers were partly baffled, but also annoyed at having their plight, not so much appropriated, as invented by other East Asians. Can Chinese Americans by offended on behalf of Japanese people who, when consulted, are not actually offended? Yet a further, ignored, angle is the question of whether it's offensive (or even inaccurate) to suggest that Japanese people are somehow underdogs with respect to white Americans in the twenty-first century. The appropriation discussion is thus a microcosm of the privilege critique more generally. Despite being ostensibly about social justice, it ends up reinforcing and maybe even inventing hierarchies." To continue summarising the book would make this review far too long (the link above will lead to the full summary), but in short, I think this is something that everyone should read because the concept of "privilege" is something that has left American shores and traveled around the world. 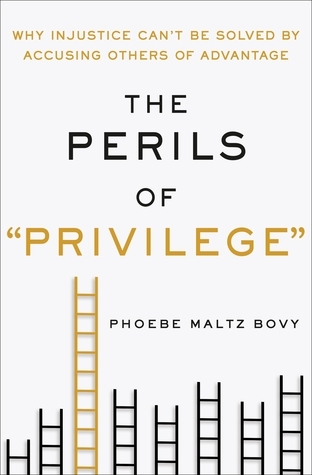 The book uses many examples to explain what the privilege framework is and how it can be problematic. As for me, I think that the privilege framework should stay in academia. It is a valid way of seeing things, but I think this victim hierarchy has a way of diverting attention from the real problem. Let's call a spade a spade, and not by a different name. I sincerely hope that the fledgling privilege movement in Singapore (which seems to be a wholesale importation of the American framework, but with the names of the privileged change) is discarded for a method that is more accurate and less divisive than the privilege call outs. Disclaimer: I got a free copy of this book from the publisher via NetGally in exchange for a free and honest review. I read this on a long bus trip, and found out that it's not light enough to be travel reading material - I will definitely have to reread this one day to more fully absorb everything. Some essays read like an essay analysing Discworld, while others read as though Discworld was added to a discussion on philosophy. On the whole, though, I found parts two and three to be the most interesting ones, although that's probably because of the topic than the writing style. In particular, essays on the Witches on Lancre and Death tended to be the most interesting ones, no matter which category they were in. 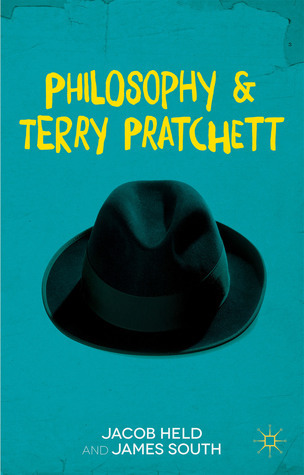 You won't need to have an understand of philosophy to read this, though it will be helpful, but you'll want to have read most (if not all) of all the Discworld books before reading this. I haven't read a few and didn't get the reference to certain plot elements. This is review is rather short but there isn't much to say. If you're a Discworld fan and are interested in exploring the different ways that we can view the Disc, then there's a good chance that you'll be interested in it (assuming you don't mind some academic language). 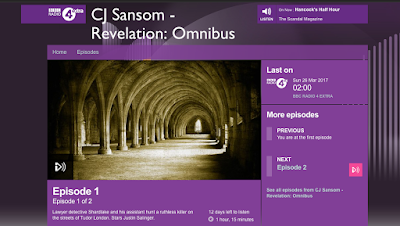 If you're a fan of audiobook and/or a fan of historical mysteries, the BBC has done a radio adaptation of Revelation by CJ Sansom! It's one of the books in the Martin Shardlake series and both parts are now available! I haven't read the book and to be honest was quite nervous about relying on the dramatisation because I tend to put podcasts on as background noise but I found myself absolutely enraptured by this dramatisation. It's only available for another 12 more days so you should check it out ASAP. You can listen to it online or through the BBC iPlayer app. Revelation is the fourth in the Matthew Shardlake series and in this book, there is a string of murders. Disturbingly, the murders bear a resemblance to what is written in the Book of Revelation, and in the current social climate, have to be solved ASAP. When Shardlake's friend is murdered, he finds himself drawn into the investigation, despite the fact that it's connected to royal politics. I probably missed a few things because I was cooking while listening to this, but hopefully I can get my hands on a copy of Revelation and the other books in the series and read (reread?) them! I can only theorise that the reason why this book lay unread for so long was because I wanted to save it. In its own way, the anticipation of a good book is almost as good as reading a good book. Luckily, I was not disappointed. The whole book is really good, but my favourite chapters would be those on the golden age of detective fiction and of "four formidable women", the women being Agatha Christie, Dorothy L. Sayers, Margery Allingham and Ngaio Marsh. I confess that of the four, I'm only familiar with Christie. I've read only one Sayer book, and none of Allingham and Marsh, which is something that I need to correct. In fact, those two chapters alone have given me quite a reading list. Oh and my copy of the book had comics about mysteries here and there - I definitely chuckled at them and liked their inclusion. I highly recommend to this fans of mysteries. This is a readable, engaging book that will probably give fans new authors to search for. P.s. 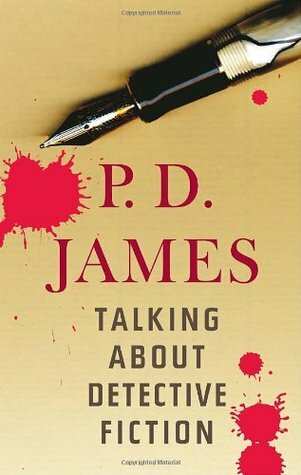 In a discussion of the modern detective fiction, she mentions C. J. Sanson and I highly recommend his works too. They're set in Tudor England and while I haven't finished the series (since I haven't been to the local library in a while), I fully intend to finish it when I get the chance. Started and finished this book in a day because I was extremely eager to see how it turned out (and by the way, I did not manage to guess who the real killer was). 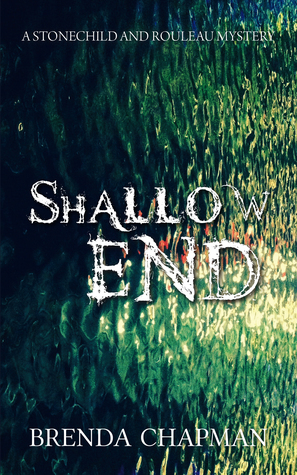 Shallow End starts with the death of Devon, a teenage boy. What makes Devon "special" is that a few years ago, he was involved in a case where his teacher was accused of sexually assaulting him. That teacher, Jane, got out of prison a month ago, so she's obviously the top suspect. But can Jane, who seems to want nothing more than to see her children, be the killer? First things first. After I downloaded the book, I noticed that this was labeled as Stonechild and Rouleau Mystery #4. Kala Stonechild is one of the detectives in the book and Rouleau is her superior. To be honest, I didn't really feel Rouleau's presence in the book, and I felt that Kala was the more active character here. That being said, I had no problems reading this book as a standalone - there are probably a few things I missed, but the team dynamic was easy enough for a first-time reader to grasp. What stood out to me was the sheer number of unlikeable characters in the book. Jane's ex-husband, Adam is unpleasant, as is his new girlfriend. I didn't like the parents of the dead boy. I didn't like Woodson, a cop that hates Jane and I didn't like the reporter either (and I seem to have forgotten her name). Luckily, I did like Jane and Kala, who were the main characters, as well as Gunderson's, Kala's partner at work. The mystery was pretty well-done, but the characters were what stood out more. I didn't manage to guess the killer either, and I thought the twist at the end was pretty good too. When I have the time, I'll probably go back and read the first few books in the series. This book was recommended to me by one of my friends on Dayre, who also recommended Ekaterina, a Russian drama on Catherine the Great! Both are really good, and I'd recommend watching the drama and reading this one after the other. So I didn't really know who Catherine the Great was, so I'm going to pretend that you don't either and give you a very brief introduction. Catherine the Great (born Sophia Augustus Fredericka) was a noble-born German girl who ended up being married to the heir to the Russian throne (who was also German). Her mother thought herself cleverer than she was and didn't give Sophia much love, and her husband didn't love or respect her either. Trapped in a loveless marriage in a foreign court, Sophia (who was renamed Catherine after converting to Orthodoxy) made the best of a bad situation by endearing herself to the Russians, overthrowing her husband after he became emperor and becoming Empress herself. Seriously a "when life gives you lemons" sort of person. 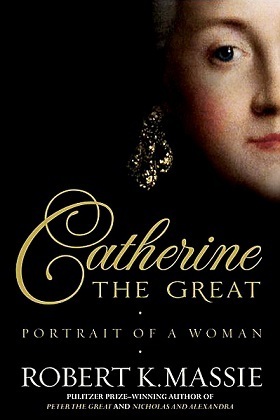 I have so much respect for Catherine after reading this, not only because of how she made the best of her situation but because she seemed to genuinely love Russia and ruled with its best interests in mind. She not only corresponded with great thinkers, she put what she had learnt into practice by writing Nakaz, which laid the guiding principals upon which she hoped Russia's new laws would be founded. Sadly, she didn't get to carry out her ideas as she wanted to (because even autocrats need the support of the nobility and army), and she didn't manage to end serfdom even though she wanted to, but I was genuinely impressed by what she managed. Russia is huge and she not only governed it, she tried to better it. Her attempts to improve the Russian healthcare system were more successful and in 1768, she was the first to be vaccinated against smallpox, to show Russians that it was safe. That put her ahead of continental Europe, which shunned it as dangerous (and considering that anti-vaxxers still exist today, this really shows how forward thinking she was). I found this book to be easy to read, although some controversial issues (like whether she married a Potemkin) seemed to be glossed over. I'm not a scholar though, so this is purely just an impression of how disputed it might have been, because I was expecting a little bit more discussion on it. If you're in the mood for a biography, I'd recommend this. I mentioned in my review of the three royals who ruled before WWI (George, Nicholas and Wilhelm) that they seemed to be victims of the birth (although I may not have used those exact words), but Catherine shows that you aren't trapped and that one can rule well even if they weren't brought up to do so. I heard about this book from someone's Teaser Tuesday (or was it a review?) and it sounded so good I had to check if NetGalley had it. Luckily they did and my request was approved so I got to read it! 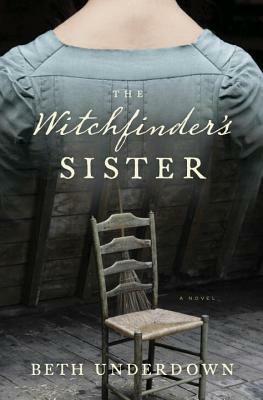 The Witchfinder's Sister is a novel based on Matthew Hopkins, who was an actual person. The sister in question, however, is made up. Alice Hopkin's husband dies and having no other place to go, goes back to her brother, Matthew. He's just beginning to get into the groove of witch-hunting and while she doesn't know much at first, she starts to know more. At the heart of the matter is the question: why is Matthew doing this? The book is written mainly in first-person, interspersed with a few excerpts (not sure if the book is real or not because my knowledge is woefully lacking). I mention this only because there is one passage that is suddenly transitioned into second person and it was rather jarring. I definitely preferred the main first-person point of view that was used. The story was, as expected, captivating. Alice is a sympathetic character who does as much as she can (although it is very little). The mystery of why Matthew is so set on hunting witches - and how that relates to their past, was well-done and the information was given out in a way that made sure the tension of the book didn't flag. The characters that stood out the most were Alice, Matthew, and Bridget, Alice's mother-in-law and their family's ex-servant. I found Bridget to be the most inexplicable because several of her actions - like her attitude to Alice after she married her son and her reluctance to tell the truth to Alice even though it would have helped - were hard to fathom. I suppose that makes her a good counterpoint to Matthew, whose motives are also a mystery. If you're in the mood for a historical novel set in a rather dark time, I think The Witchfinder's Sister will hit the spot. It is definitely not a lighthearted read, but it is captivating and well-written (except for that one second-person passage but this is more of preference than anything). Hey everyone! Guess who just entered the working world? I've worked for two days, and I'm now in the training phase. But I'll get assigned to my first department soon, so hopefully I get used to things and can read more. Not to mention write more - right now, I'm reading a book on writing as a way of continuing to learn even when I'm not actively writing. "Novels and memoirs that captivate readers do so because they are an experience, an escape into a new world, a voyage of sorts, allowing us to feel how it might be to briefly live a life different than the one we've been given. This experience goes back to the most primitive storytelling das, the gathering of our distant ancestors around a communal fire, the long-ago beginnings of our great myths and hero's journeys." 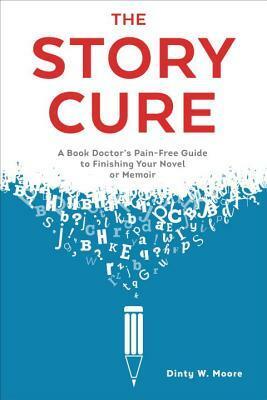 I'm quite enjoying The Story Cure, because it gives both good and bad examples. The bad examples are probably more illuminating than the good ones because they show you what not to do. 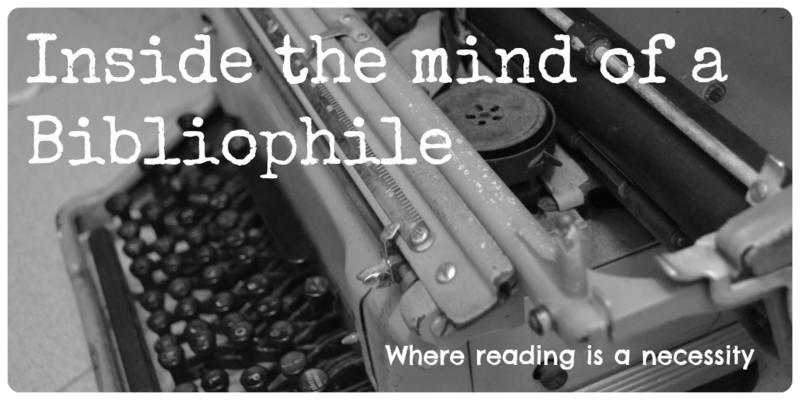 What are you reading, and how are you doing? This is another door stopper (but luckily in eBook format) from Elizabeth Kostova. I've read her debut work, The Historian, a couple of years back and while I don't really remember it, the Goodreads review says that I quite enjoy it (as I quite enjoyed this one). The Shadow Land is a sort-of mystery. Alexandra Boyd has just arrived in Sofia, Bulgaria when she realises that she accidentally took an urn. Containing human ashes. The name on the box is "Stoyan Lazarov", and as she tries to return the urn (with the help of a friendly taxi driver nicknamed Bobby), she finds threats and danger lurking. 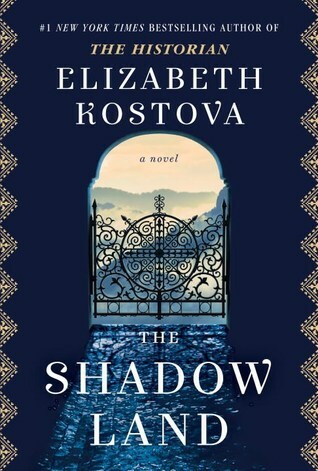 And she also finds out more about Stoyan Lazarov, a gifted violinist as she tries to figure out why having his urn is so dangerous. When I get a really, really thick book, I like to skip to the back to see how it ends (yes, I know, it's odd and I shouldn't do it). In this case, skipping to the last 50 pages didn't help because you really have to read the entire life story of Stoyan to understand what is going on, which means that I'd have to read the second half of the book in its entirety to get any spoilers. As for the characters - sorry, Alexandra, but Bobby is the star of the show. Alexandra is likeable enough, but I basically got her entire backstory in the first few chapters, while Bobby was continually surprising me over the course of this almost 500 page book. Obviously, the surprising character is the one that made a bigger impact. Apart from Bobby and Alexandra, there is a whole cast of supporting characters (and Stoyan), though I only really remember Stoyan, his wife, Neven and Irina. The rest just sort of blended together. The villain was pretty clear and quite menacing, though the 'twist' for one of the bad guys was difficult to understand.